Welcome to Full Plate Thursday and Welcome June! It is so good to see you here today, it is a wonderful season for fresh foods from the gardens and farmers markets. We are gathering in our garden patio today so we can enjoy the freshness of all the garden vegetables that available. I can't wait to see all the wonderful recipes that you will be sharing today so lets get the party started! So many tasty looking dishes! Thanks so much for hosting such a great link up :) Have a fantastic evening! 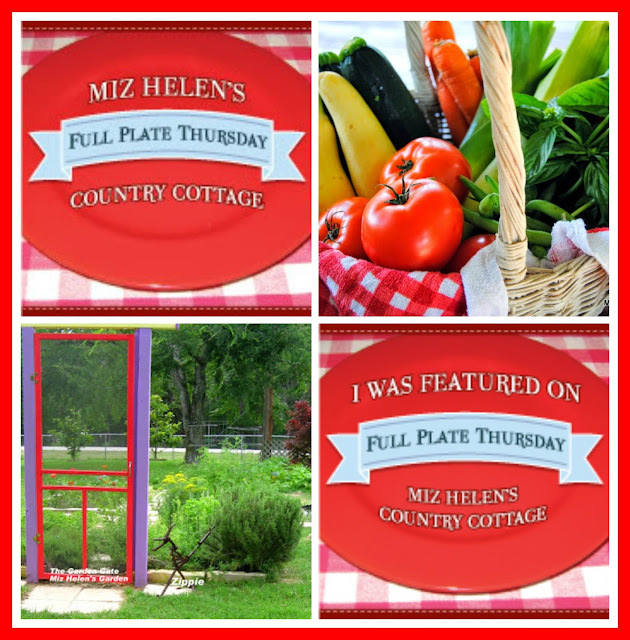 Your corn salad and your sliders sound and look so tasty, Miz Helen! Thanks so much for hosting and have a great week. Thanks for the party Miz Helen, I have my eye on that root beer BBQ sauce from Lynn too! Yum! Have a delicious week! Miz Helen - I love being a part of your fun party. You are just the sweetest hostess. Thanks! Hello Miz Helen! I'm so pleased it's June, it's one of my favourite months. Now if the sunny weather will just come back here in England it would be lovely :-) It's more like September here at the moment! Today I've brought a recipe for Old Fashioned Spice Cake that has been part of our family for 4 generations. Thank you so much for hosting. Have a lovely weekend! Thank you MizHelen for hosting, I am trying to blog with my phone, and I'm trying to get the red plate on blog Living On Loblolly Lane, for top 10 feature of ranch dip pototoes last week, and thank you, I'm giddy with happy, happy happy. The salad looks perfect for Summer dinners! Thank for hosting the party, Miz Helen! Miz Helen, the first thing I'm checking out is your pea salad! I love pea salad, and I'm the only one for miles around who makes it. Most of the people I serve it to have never heard of it. But my mother, aunts, cousins on that side make/made it -- must be an English thing! It was so nice to see my Patriotic Pretzel Brownie on your list today! Thank you so much for hosting! I hope you enjoy this lovely day! Thank you so much for hosting such an awesome and tasty party! And thank you for the feature pick!!! I am so excited!! !